Saturday's game between Amiens and Lille began badly for the hosts, but goal scored in the 15th minute by Fodé Ballo-Touré preceded something much more unfortunate. As the scorer rushed towards the away section, fans rushed towards the front row to celebrate with him. Congestion caused a barrier to collapse and with stands in Amiens' Stade de la Licorne being elevated above field level, this caused dozens of people to fall roughly 2 meters down onto one-another. As of now we know of 27 people injured, 5 of them seriously. Following over half an hour of assesment it was decided that the game will not continue on the same day. 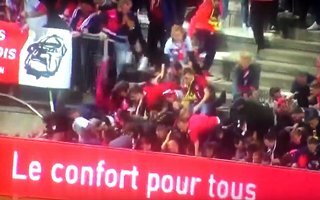 Events saw an unfortunate turn soon after the game when SC Amiens president Bernard Joannin publicly suggested that Lille supporters were aggressive and trying to carry out a pitch invasion. His statement was soon revoked and replaced with expression of solidarity but president of Lille OSC Marc Ingla first condemned it as unworthy and irresponsible. Speaking of responsibility, a public inquiry has been opened into the incident. Stade de la Licorne is currently undergoing phased redevelopment but it's understood no works should have contributed to the event.